Our world today is divided and polarized. People are hurting. People are in need of the love of Jesus. People are in need of compassion and assistance. Rather than waiting on the world to change, it is time for Baptists to step up and become the change we wish to see in the world. ... It is time for Baptists to quit waiting for the world to change. It is time for us to come together and stand up. We need to focus on our shared calling and put aside our differences. We need to put forth a more positive image of Baptists so that we can become more effective in reaching people. And we need to unite to share the love of Jesus because our world desperately needs it. 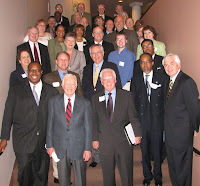 By the way, I'm the one in the blue shirt in the photo taken at the Carter Center. 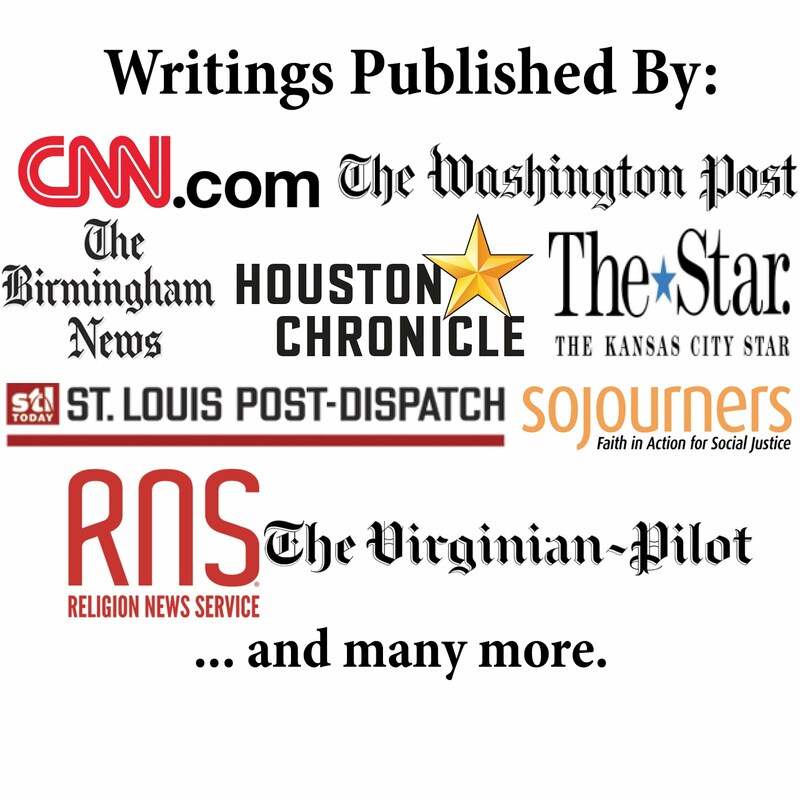 * Roy Medley, Executive Director of the American Baptist Churches - USA has a good column entitled "Why I am Excited About the Celebration of the New Baptist Covenant." He makes some great points as to why the Celebration is needed. *Marty Duren has an excellent blog post entitled "A Tale of Two Kingdoms." Wade Burleson has a good blog post, which is entitled "Do You Know What In the Sam Hill a Baptist Is?" And Art Rogers makes some great points in his blog post entitled "Carter Quandary." *There have been a lot of misstatements about the Celebration. Some have really missed the boat by calling it a "Liberal Baptist Event." However, there are not only conservative speakers but also conservative Baptist groups involved. I hope the critics will at least pray for the gathering and even consider attending it. *The New York Times reports that former presidents have often attacked current ones, which shows that Huckabee's claim about Carter breaking the "unwritten rule" is inaccurate. As historian Tim Naftali, the director-designate of the Richard Nixon Presidential Library and Museum, stated, "I love how because of our short memories, we come up with these eternal rules that don't really apply." Attacks have included Ford on W. Bush, Eisenhower on Kennedy, the H.W. Bush on Clinton, Nixon on H.W. Bush, T. Roosevelt on Taft and Wilson. *Jay Leno joked last night about Carter's comments. 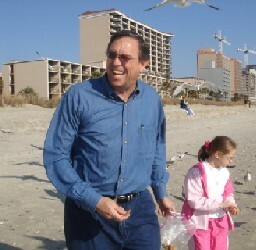 He poked fun at Carter by saying that Bush might be the worst "for those who don't remember 20 percent mortgage rates." Then, after mentioning Carter's work with Habitat for Humanity to build houses for the poor, Leno remarked, "Today President Bush lashed back at Jimmy Carter. He said, 'hey if it wasn't for me there wouldn't be that many poor people for you to build houses for.'" I am sure there will be much more in the coming months. Is that Bruce Prescott in the picture? His face is kinda obstructed by someone's hair. I'm about exhausted trying to defend the NBC in the SBC blogosphere. One blogger told me to get an advanced degree (like I'm not already working on one!) and then come back for some "first class intellectual conversation." You can't have a productive chit chat with those types. Yeah, that’s him. Although it does almost seem like he’s trying to hide. It was nice to be able to meet someone in person that I had chatted with in the Internet world. Perhaps someday we’ll actually meet as well. It has been a little crazy in the blogosphere, and I’ve been glad to not be the only one out there trying to get the good word out about the Celebration. Although I don’t expect to change the minds of those posting, I figure the people who are reading but not commenting might be less ideologically-driven and thus more open to giving the Celebration a chance. Thanks for stopping by and thanks for helping promote the Celebration. As one you would probably refer to as a "fundamentalist", allow me to apologize to you for whoever that was that made that statement. It was degrading and demeaning. Wht some of my brother fundies, fail to realize is that this type of rhetoric hurts us as we do know how to argue the issues. I have no problem with President Carter being a politician (such as Bush remarks). I know plenty of believers with similar feelings. I have a big problem, though, identifying with a new "prophetic Baptist voice" which may well sound a whole lot like his. Until President Carter explains how Rabbi Lerner could so misrepresent his remarks in their early-May meeting (link below), I encourage you to reconsider your follow-ship. I seriously doubt Carter would qualify to teach an adult SS class in your church, with these inclusivist / pluralist, anti-evangelical views. Should one working against evangelical Christians be leading them? Those ellipses in the long excerpt are alarming me, brother! Have a glorious Lord's Day! Tim: You make a great point about the need for us to be careful with our rhetoric. Although we have different perspectives on the Celebration, I do not think you have had problems like the individual BDW referred to. I find it great to have healthy dialogue with a Christian brother like yourself. So thanks for stopping by and sharing. As for your second comment, you really made me laugh! Although, I would contend that I am not taking it out of context like you did with the ellipsis over at Wade Burleson’s blog. But well played. :) Glad you saw the humor there. Seriously, Brian, please know that I believe you are a brother in Christ, and I am not condemning, only contending (fiercely!). I really don't want to see a diluted, confusing gospel message come from a national gathering of Baptists, which is why President Carter needs to bow out. Notice I didn't say you, Bill Clinton, or soon-to-be-Dr. Big Daddy--just the one who's headlining the event, and who has made all the revealing,damaging (theological, I'm not talking about the political) statements. Now, as an older guy to a youngster, "Get your head out the sand (or clouds) and find out the truth--don't just call it 'hearsay 'when it may well be 'heresy.'" Re: your Ethics Daily article, I agree Jimmy Carter is not the anti-Christ. However, I've never mentioned abortion or the other political issues. I must remind you also, by your definition, that using Wade Burleson's report of Carter's comments is relying as much on hearsay as my using Rabbi Lerner's. Selective and incomplete is my review of this one, Brian, though well-composed. Chuck: Thanks for the comment. Sorry I was not able to get the Rabbi's remark directly (the piece was getting pretty long, which is why most journalism is selective and incomplete). However, I think the quotations I have from Carter about Jesus stand in direct opposition to the Rabbi's claims. As for the hearsay, we are actually much closer to Wade (as he has been online to answer questions and clarify) than the reading of a Rabbi's remarks in a magazine. This should give us greater confidence in the accuracy of the report (Carter through Wade rather than Carter through Rabbi through Newsweek). I'm going to post the Ethics Daily piece in a moment, so if you want to continue discussing it, let's move it to that post.